Aside from a homemade lip exfoliant recipe I posted years ago, I believe this is the first food recipe I have ever posted. Correct me if I am wrong. I love cooking but rarely follow recipes, making it difficult to pass on exactly what I make. This has been an issue when people ask for my pulled pork recipe… what recipe? Also, let me clarify: I cook, I do not bake. Baking tends to require you to follow recipes more than cooking and thats where you lose me. Recipes are great guidelines for getting quantities and flavours right, don’t get me wrong. I just personally like doing my own thing in the kitchen. The other evening while cooking dinner, I had the urge to make something sweet for dessert. I started exploring my pantry and due to my lack of baking, I did not have many options. I found some coconut milk, cocoa powder, honey, coconut shreds and some other items. It was like an episode of Chopped! What was in the mystery pantry?! 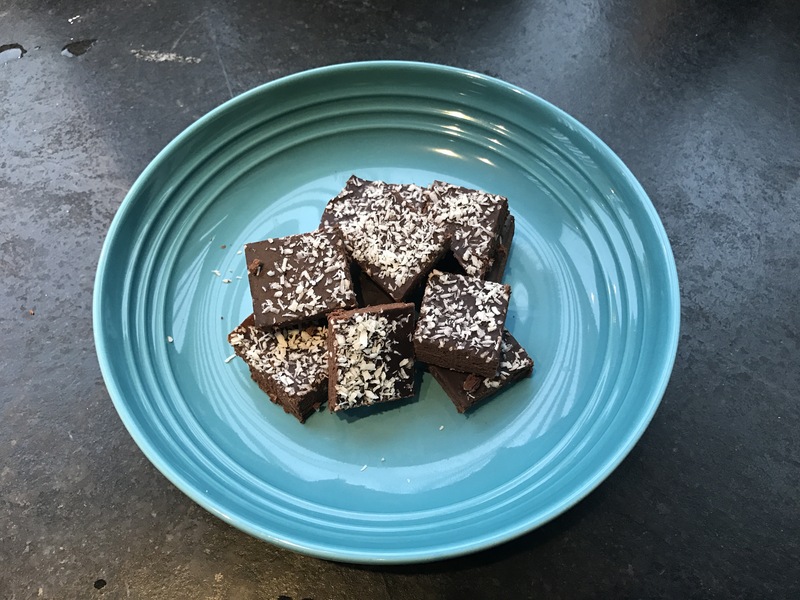 I googled what I could make with such few ingredients and found a recipe for “the best coconut oil fudge.” This could work except for one minor detail: I was out of coconut oil (which I usually have because I love cooking with it). I had coconut butter and decided to just try it as a substitute. If you are curious, the difference between coconut oil and butter is that coconut oil is just the oil that has been extracted from the meat. Coconut butter is basically pulverized coconut, giving you more texture and density. They both melt easily and have the same hardness when solid. *and my added coconut shreds! The end result was awesome! They are not overly sweet which fudge can tend to be but deliciously fudgey. The recipe was a bit small and I will definitely be doubling it next time. Plus, its annoying to have that much leftover coconut milk… I froze mine into cubes for convenient future use. My boyfriend and I ate several before this photo…there were more.